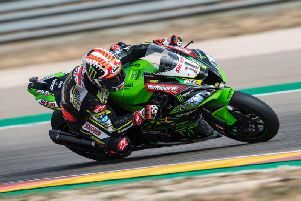 Jonathan Rea claimed his eighth successive runner-up finish this season behind Alvaro Bautista in the Superpole race at Aragon on Sunday. The Aruba.it Ducati rider was never threatened as he roared off into the distance on his V4-R machine to maintain his dominance of the series in his rookie season in Superbikes, coming home with 5.7 seconds in hand. 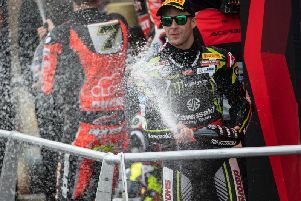 Northern Ireland’s Jonathan Rea took the runner-up spot for the eighth consecutive race behind Bautista, with the Kawasaki rider recovering from a mistake on the brakes into Turn 1 with three laps to go, fighting back to pip Pata Yamaha’s Alex Lowes by a tenth of a second on the line. Chaz Davies was a close fourth on the Aruba.it Ducati after closing in on the battle for second in the latter stages of the sprint race, without really being able to land a blow. BMW’s Tom Sykes finished fifth ahead of Toome rider Eugene Laverty on the Team Go Eleven Ducati. The second full-length race will be held at 13:00 BST.